The spoiler or wing that is put on a car is there for a few reasons. For many of us adding a wing to the back of our first car while in high school allows our little Honda Civic to look much more like it belongs on a track with other winged cars, even if it’s really only for show. For other cars, especially the high priced, high powered models, the wings are in place to offer greater downforce, rear end stability and aid in the overall aerodynamics of the car. Here are fifteen cars that have massive wings attached to them, many might just surprise you. Even though your first thought of an Aston Martin is most likely from a James Bond movie, these awesome cars have been involved in racing for decades. With a 6.0-liter V12 engine underneath that pushes 591 horsepower this car can nearly take off without the wing to help push down on the rear of the car. Adding this massive piece of hardware has made the Vantage a fantastic driving and racing machine for many road courses and can be great for your dynamic driving pleasure as well. 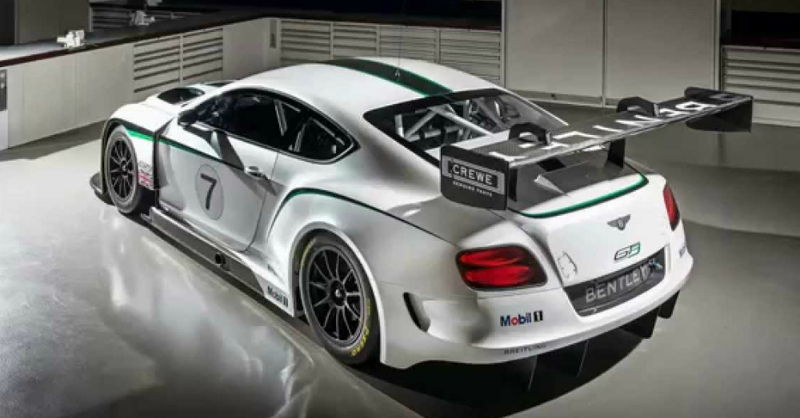 Why would you ever put a large wing on the back of a luxury player like a Bentley? Well, if you take out the back seats and take the 4.0-liter twin turbocharged V8 to a full 572 horsepower you just might need a wing to help keep things under control. With the carbon fiber parts that help reduce the weight by 221 pounds, this version of the continental can reach sixty mph in only 3.6 seconds and boats a top speed of 170 mph to give us a Bentley that is more than just luxury; its excitement. The large wing found on this track ready version of the Camaro give plenty of force downward to help improve the overall control of this leader of the current pony cars. There is even a small detailed piece called a “wickerbill” which tops the spoiler and adds a significant amount of downforce to the rear of the car. This set up proved to be a leader on the world’s most famous test track of Nurburgring where it completed the lap in an amazing 7 minutes and 37 seconds, showing off both control and speed when it made the run. Not only does the Corvette have a large rear spoiler, but it has a variety of three that can be chosen from to add the necessary downforce to the car. When you have 650 horsepower and lb.-ft. of torque under the skin the chance the car may actually take off and fly is a real possibility. The selections for this spoiler are the standard Z06, a larger carbon fiber choice or the Z07 performance package that has such a large rear wing the center section was made transparent to allow clear rear visibility. The Viper has always lived up to its name being a mean machine ready to strike without warning and the latest version is no exception to this history. The 8.4-liter V10 that puts out 645 horsepower must be tamed somewhat in order to keep the car firmly planted on the road and a pair rear wings do the job. You can choose between a 70-inch wide wing and a 73.9-inch one that comes in the Extreme Aero package. Either way this car is a monster to deal with and has more control in a corner than nearly any other car on the road. Yes, a Focus with a wing may sound silly, but the Focus RS is quite a powerful little car and in need of some rear end downward push in order to keep itself firmly planted. This is the result of putting a 345 horsepower 2.3-liter turbocharged inline four-cylinder engine under the hood to give Focus lovers the most fun they have ever had in this hot hatch. What makes this even better is the fact this Focus features all-wheel drive and a six-speed manual transmission to give you the most engaged ride ever in a Focus. Now this is a car that looks like it might need more wings, but in reality has been engineered to take advantage of how it is built. What makes it special is the angle of attack, especially since the wing is not high up on the car or particularly wide. The sculpted carbon-fiber bodywork actually creates dual channels along the entire body that feeds air to the wing in order to allow this part to do its job. This is truly ingenious and when you have 600 horsepower aboard sometimes a bit of out of the box thinking is needed. Without some of the other engineering pieces the wing for this track ready Mustang would need to be much larger but thanks to the enlarged front splitter, fender vents and new side skirts the airflow around this car helps keep it firmly on the ground allowing for a much more attractive and smaller rear wing to be used. The curved carbon fiber wing is certainly one of the most attractive additions to this car that is built to handle the duties of a racetrack with perfection and ease. Thankfully this feature has been updated for the new XF, but for the outgoing model the wing nearly looked like and out of place item that was better suited for a Honda Civic or Ford Focus. Either way, the wing for this car certainly did its job, especially when you take the 5.0-liter V8 550 horsepower engine to the top speed of 186 mph and back. As an executive sedan this one certainly was a stand out that made for a more engaged driving experience than those from other manufacturers, allowing the top brass to let their hair down and have some fun. Of course this super hypercar has a huge wing on the back. Without the wing to create downforce on this racing megastar we might see these on some of the worst lists as they would flip and crash with relative ease. Instead, the impressive wing helps to create the downward push needed to keep this amazing car on the road and let us admire the awesome power and speed of this beauty. This car is so crazy awesome it can reach 186 mph and return to zero in only 21.19 seconds, a feat no other car can match yet. This is the Aventador on steroids with more power, less weight and much sharper handling. Amazing that the wing is so large but also so subtle and simple rather than another over the top Italian feat of engineering but this big wing definitely does the trick for this awesome car. The wing is shaped like a boomerang and runs the rear shape of the vehicle to help keep the V12 powered beast firmly planted on the track, making it capable of super-fast driving that leaves the competition behind. IF you are seriously going to pack in 903 horsepower to the power system of a car you better provide a way to control the beast. This is the case for the P1 which has a 727 horsepower 3.8 twin turbocharged V8 engine along with a 176 horsepower electric motor. The run to sixty is less than 2.8 seconds and with all this power we need some control. The wing on this supercar is the size and shape of a whale’s tail and has front and rear active movements to allow the car to reduce the drag and maximize the downforce on the rear and keep this beauty under control. How does 7 minutes and 8 seconds around Nurburgring sound? It think it sounds simply amazing and the GT-R Nismo performed that feat and many more to make it one of the most anticipated super cars to come off the lines at Nissan in a very long time. What makes it an even greater feat is the 600 horsepower that comes out of a 3.8-liter twin-turbocharged V6 engine, which might be the most ever from a six-cylinder engine. Of course with such a powerful super car there must be an overly aggressive wing on the back to aid in the downforce, which the GT-R has to complete the package. Porsche has been making the best sports cars on the road for many years and it’s really difficult to dislike any 911 mode. The GT3 RS offers not only one huge and high wing, but another that is integrated in to the engine cover on the back of the car. This car has several elements that make it more track ready than the GT3 which include a magnesium roof panel, carbon fiber trunk and engine covers, a wider track and stronger brakes, all meant to make this one of the best track performers ever from Porsche. This car has come with a large rear wing for many years but for the newest model you can actually order it without the wing, but the car will probably look naked if you do. With this huge wing in place this car appears to be a throwback to its rally car days and certainly helps bring you attention from your buddies, but also from the police. This wing is a lot for looks, but push this fun car onto the track and you will find that it has a real purpose and helps keep this AWD beauty on the track for you. Not every car needs to have a spoiler or a wing, but most cars look much more aggressive and sporty with them. A majority of the cars on this list are made to be track ready speed demons and take on the challenge of driving at high speeds which require a great amount of downforce from these huge wings on the rear of the cars. Whether you love a wing on your car or you think it looks silly, in many cases having the added force from this simple but important part can be the difference in control and winning or losing a race.